The ladies tell TR how it is after the presentation! Teddy Roosevelt is arguably of our most colorful President. There are not many who can put on their resume: Author, Cowboy, Naturalist, Statesman, Soldier, Governor, Vice- President, Policeman, Nobel Peace Prize Winner, President, Father and Bull Moose! 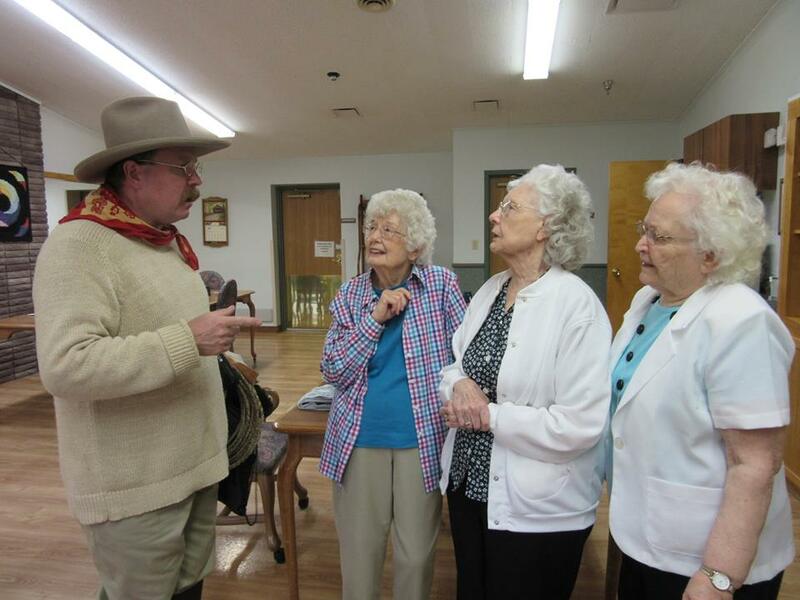 TR’s senior focused program is a fun and engaging talk about the exciting life of Teddy Roosevelt – from an Asthmatic childhood, to the loss of his wife and mother on the same day, to his ascension to the Presidency. Audiences learn about the conservationist President in first person and the 230 million acre legacy of National wild areas he left for all of us to enjoy. The typical program runs for 45 minutes with 15-30 minutes of question and answer, and is one of the most popular adult education programs available nationwide. Photos and more conversation is sure to follow! See Testimonials to read what others are saying about this fun and fascinating program. Contact me directly and let’s discuss your program!